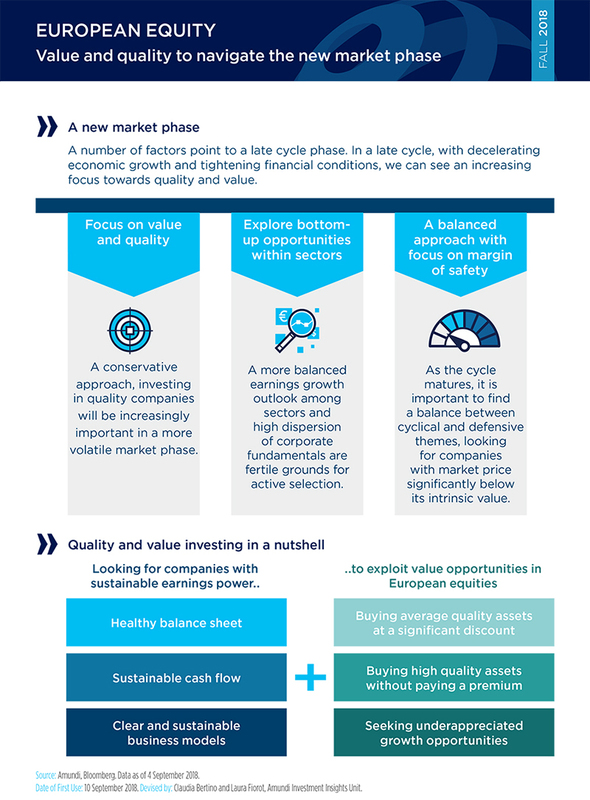 In a maturing phase of the cycle, we think that a focus on quality companies that are able to deliver sustainable earnings growth in the future and that are trading at discount levels, will be key to exploring the most compelling opportunities in European markets. We believe we have entered a mature stage of the financial cycle amid central bank monetary policy normalisation (more advanced in the US) and decelerating economic growth globally. Protectionist dynamics are also features of this phase of the cycle, while the US fiscal expansion and a capex revival are all forces working to extend it. The move to a late stage of the cycle is leading to a tightening in liquidity and financial conditions and to potentially more frequent episodes of volatility spikes, such as the one experienced in February. Market swings in 2018 have been the result of this new, less complacent and less directional market, which we expect will continue. 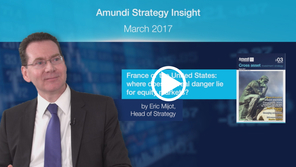 In 2018, investors have so far been more cautious on European equities. In fact, while valuations remain relatively compelling, multiple political risks weigh on the appetite for this asset class. In the short term, a series of events will continue to create noise on European assets: country-specific political deadlines, the continuation of trade disputes at least until the US mid-term elections in November, the starting of the campaign for the 2019 European parliament elections and the Brexit negotiations. 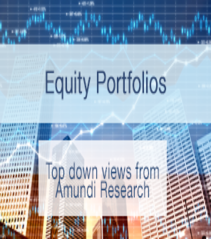 With the uncertainty led by this newsflow, we believe that European equities are starting to offer pockets of opportunities, especially for stock picking investors. We think that 2019 could mark a comeback to this asset class as global investors reassess the equity opportunities in the markets, with a stronger focus on the quality of companies, diversification of their portfolios and avoiding crowded and overvalued areas. When this occurs, we think that a focus on quality companies that are able to deliver sustainable earnings growth in the future and that are trading at discount levels will be key to exploring market opportunities in Europe. In our view, the most likely global scenario for the next 12 months is consistent with still-above-potential economic growth, but with it probably peaking and being exposed to vulnerabilities (protectionism and geopolitical risks). With this backdrop, the outlook continues to be positive for earnings globally and in Europe, but with a more balanced growth profile among sectors expected for 2019, hence calling for an increased focus on stock selection within sectors. Looking at valuations, Europe looks relatively attractive – with the price/earnings ratio of MSCI Europe falling well below the 20-year average after a volatile first half of the year. Key variables to watch in stock picking in Europe will be the currency dynamics and the interest rate outlook. On currency, even if fundamentals continue to support the appreciation of the Euro on a 12-month basis, significant short-term uncertainties remain in place. While the shorter-term volatility in the currency may affect certain names and sectors (such as exporters), we see the underlying economic strength outweighing any currency volatility. The interest rate outlook, with the ECB gradually exiting the ultra-accommodative monetary policy, could benefit value themes and the financial sector, a key sector in Europe. Here selection remains paramount as the sector is undergoing a profound transformation driven by increased regulation. With still significant dispersion among stocks in Europe, investors should consider embracing an active bottom-up stock picking approach to identify the companies that are better positioned to deliver sustainable earnings growth in this environment. A focus on healthy balance sheets and clear and sustainable business models, plus putting in place appropriate	margins of safety while focusing on attractive valuations, will be key to investing in European equity markets going forward. In a late cycle, with decelerating economic growth and tightening financial conditions, we can see an increasing focus on quality in equity investing. 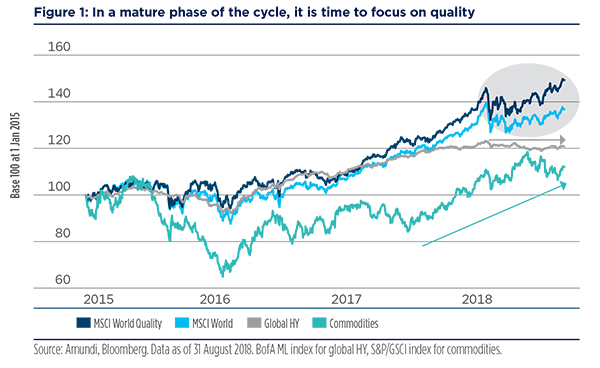 Financial markets are moving towards a more advanced phase of the cycle, characterised by potentially higher levels of volatility than those that prevail during an asset reflation phase, commodity prices trending higher, less appealing high yield markets and a rotation towards quality in global equity markets. What is driving the transition is primarily the Fed hiking cycle, which started in December 2015. Historically there is a two-year lag between the Fed hiking rates and an increase in volatility, and the market is now starting to perceive the liquidity tightening. The effect is currently emphasised by the simultaneous process of the Fed balance sheet reduction in the US and also by the approaching end of quantitative easing in the Euro area. Even if these effects should be tamed by the persistence of central banks’ gradual approaches, and by their very cautious communication stances, the decrease in liquidity is contributing to the wider market swings. Moving ahead, investors will continue to look for opportunities in global equity markets, but with a more prudent approach as geopolitical and trade disputes further add uncertainty. This is particularly true for Europe, where multiple upcoming events (country-specific political deadlines, campaign for 2019 European parliament elections, Brexit negotiations) will to be at the forefront of investor concerns. Interest rate and bond yield outlooks. 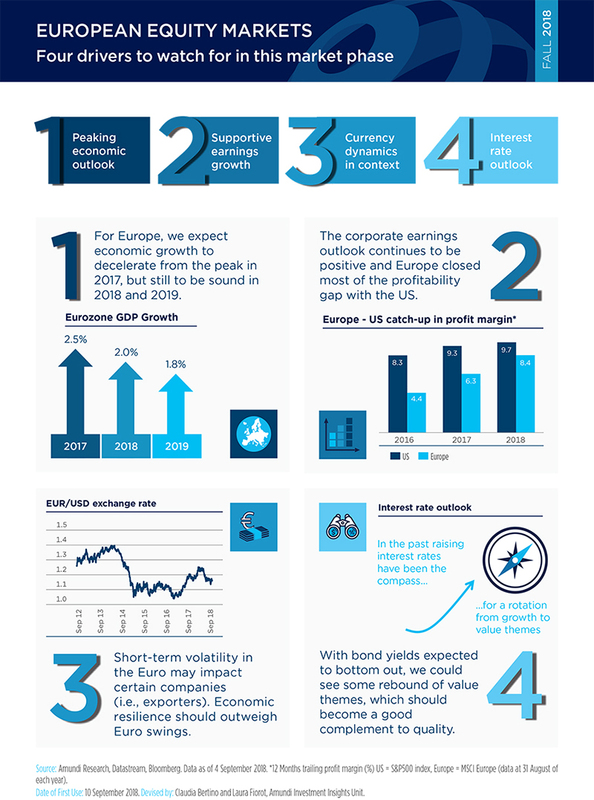 All these elements will affect the ability of companies to deliver sustainable earnings growth, which will be the leading driver of performance for European equity investors going forward. The economic backdrop for corporate businesses is still supportive, even though the European economy looks likely to have approached its growth peak. There has been a notable decline in the survey data (business confidence indicators, PMIs ) in the first half of the year. Growth expectations were too high in 2017, and the market has adjusted towards a still benign scenario, in which most of the growth acceleration is behind us. 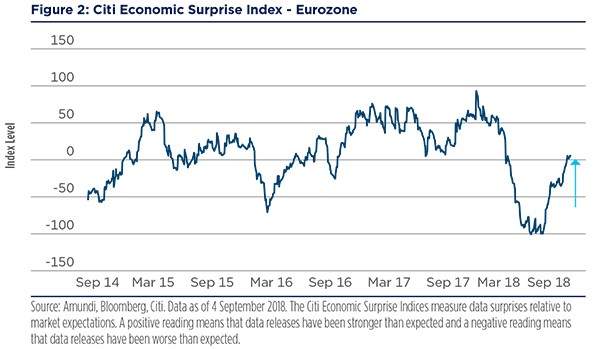 This is mirrored in the sharp deterioration of the economic surprise index in the first part of the year, which, however, has started to turn around in Q3. While we expect growth to decelerate gradually from the 2017 peak, GDP growth would still remain above its potential. The Eurozone continues to enjoy strong domestic demand prospects. In addition to less restrictive fiscal policies and the supportive external environment (barring an escalation in trade disputes), the recent mild increase in wages – for instance in Germany – should support both purchasing power and domestic consumption. The solid demand and the positive earnings outlook should continue to sustain corporate capital expenditure, in a virtuous cycle for productivity and corporate earnings, which can be deployed with a medium-term perspective. Alternative scenarios to this central case could clearly emerge, and have to be carefully monitored. The most significant risk at the moment is related to protectionism and the escalation of trade disputes. 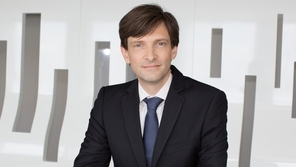 Word trade has so far been resilient, but the threat of a trade war weighs on the Eurozone, which is particularly exposed (the Euro area, for example, has a higher share of exports to GDP compared with the US, an increase on US tariffs on cars imported from Europe would have very uneven consequences on Eurozone countries, with Germany being the hardest hit). An oil price rally could also negatively affect growth, especially in Europe. In contrast, a positive catalyst could come from progress towards the completion of the banking union and of the capital market union, which could considerably strengthen Europe economically, politically and financially. This could be a potential game-changer for a structural raise of confidence towards the European equity market. At this point, we believe that the probability that this will happen in the short term is still low. The most likely framework is one of still-sound growth, without exuberance, where positive surprises (i.e. further fiscal accommodation) are needed to lift the market beyond what is currently priced in (earnings growth at almost 8.5% in 2018, IBES estimate). As seen above, following a year of sound growth, the outlook continues to be positive for corporate earnings through 2018, with stabilisation in 2019 taking them close to the cyclical peak. Top line growth remains strong as corporate revenues are benefiting from external growth: for example, more than a quarter of European revenues are directed to emerging markets (EM), so as long as the demand in EM is not put into question, it is proving advantageous for European corporates. This could further support margin expansion in the Eurozone due to the multiplier effect of the operating leverage (the sensitivity of operating income to sales growth). In fact, as the Eurozone has a relatively high portion of fixed costs, mainly associated to labour, Euro companies tend to have a higher operating leverage compared with US and EM companies. This is helping European market profitability close the gap with the US market. European companies are closing the profitability gap with the US, thanks to strong corporate revenues. We also acknowledge the progress being made in corporate deleveraging. During the financial crisis, European corporates were particularly active in terms of cost reduction, and in reducing financial leverage quite aggressively. These steps were important, as companies made significant efficiency gains, and this has ultimately placed them in a very strong position to benefit from the current supportive economic backdrop, and to leave space for re-leveraging in more attractive conditions. 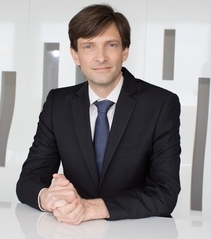 Lower vulnerability in the banking sector is also supportive for the European market. 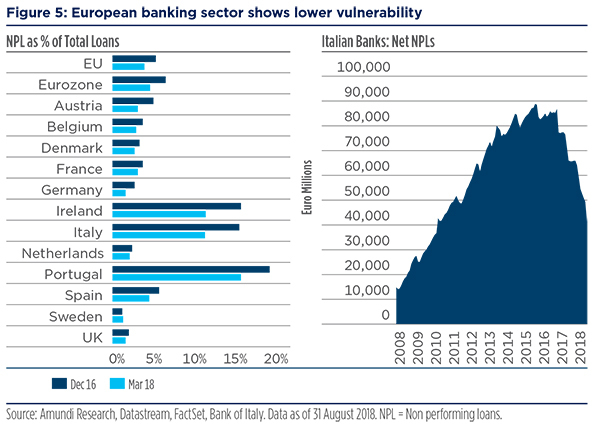 European banks also made progress in consolidating their balance sheets, in reducing non-performing loans, in strengthening their capital bases, and in adhering to the regulatory and supervision requirements. In the case of banks, identifying those more exposed to domestic growth, and with healthy balance sheets and limited non-performing loans, will be crucial to benefiting from the new phase of the market. The European market looks relatively attractive, with the price/earnings ratio of MSCI Europe falling below the 20-year average. 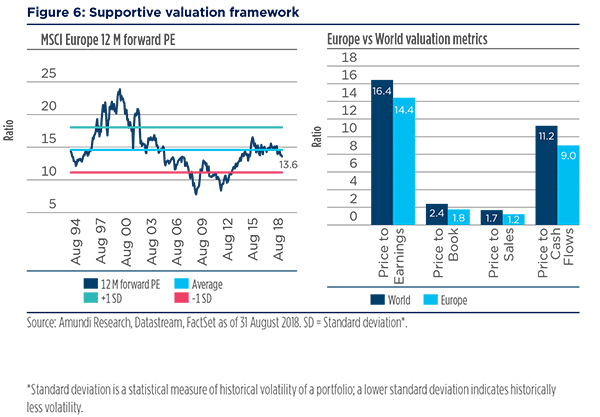 On valuations, Europe looks attractive, with the price/earnings ratio of MSCI Europe falling below the 20-year average after a volatile first half of the year, and compelling valuation metrics compared with the global equity market. With equities remaining a favourable asset class despite lower returns, in a late phase of the cycle, investors will likely start looking more carefully at further diversifying their allocation and valuations will be a key factor to watch. In addition, another positive driver for the market could come from a resurgence of M&A activity and corporate buy-backs within the region. Global M&A has accelerated, driven by US activity, but Europe has lagged behind, and M&A volume in 2017 was around half the pre-crisis level. The improved growth in Europe creates a fertile ground for M&A for companies with strong balance sheets and high cash levels, should the political landscape become more stable and volatility not be too high. In this context, M&A activity is expected to moderately increase in the next 12 months, with a positive impact on value creation. As corporations focus on core business activities and carve out non-core but profitable assets, foreign (and domestic) buyers will have, we believe, a larger pool of attractive acquisition targets in Europe. 3. Euro: headwind or tailwind? The Euro strengthened last year until March 2018, and retraced significantly afterwards. In trade-weighted terms, the Euro is now slightly weaker since the start of the year. In recent months, the depreciation of the Euro and the strength of the dollar has come from a combination of technical (a massive short in USD from investors) and fundamental factors, in particular from both central bank asynchronies and growth differentials, also considering the soft patch that Europe experienced in the past months. In the medium term, structural factors (current account deterioration and expansionary fiscal policy) and the unpredictable policy of the US could, in our view, be a drag on the USD in the absence of a global economic slowdown, but in the short to medium-term we could see the dollar strength persist. Shorter-term volatility in the currency may impact certain names and sectors (such as exporters), but we see the underlying economic strength outweighing currency volatility. How are these FX swings affecting the equity market? 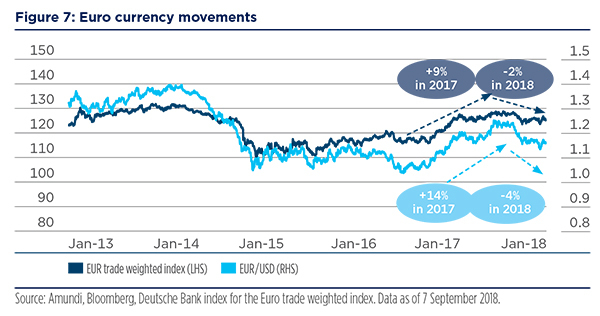 It is important to identify the drivers of the currency movements: last year the currency strength was largely a result of the improved fundamental picture, so in our opinion it should not be seen as overly detrimental. On the other hand, a weakness of the Euro driven by a lack of confidence or geopolitical risk could be more dangerous for the market, even if exporters could benefit in the short term. Our view remains that, while the shorter-term volatility in the currency may impact certain names and sectors (such as exporters), we see the underlying economic strength outweighing any currency volatility. Selection will continue to be key, in our view, to assessing the potential currency impacts in the shorter term, both on the cost and revenue base of a given company, in order to mitigate risk due to potential currency appreciation. Besides currency movements, the interest rate outlook could also affect European equity market. Rising interest rate dynamics are generally negative for stock prices, as future earnings are discounted at higher interest rates. This is particularly true for bondlike sectors (real estate, telecom, utilities) that are more vulnerable to the rise in interest rates. Overall, we see most of the US hiking cycle behind us and no major pressure for significantly higher rates in Europe. However, with the European Central Bank gradually exiting ultra-accommodative monetary policy, we expect some support for value themes in Europe, thus reverting the recent weak trend. Yield curve steepening could benefit the financial sector. The movements of the yield curve will be also a relevant factor to watch. If medium- to long-term interest rates rise more than short-term rates, the banking sector, to which the European index is heavily exposed, will help to “hedge” as it typically benefits from the steepening of the yield curve. Banks’ profits depend on the net interest margin. The maturity of the asset side (loans) is generally longer than that of the liability side (debt/ deposits), so banks will be able to boost the interest income without facing the same increase in funding costs. However, we are aware that the financial sector globally, and especially within the Eurozone, is being impacted heavily by the more stringent regulatory measures implemented following the financial crisis. As such, we believe that investors should be selective and focus on companies with adequate capital reserves on the balance sheet, and that are operating in compelling underlying markets. 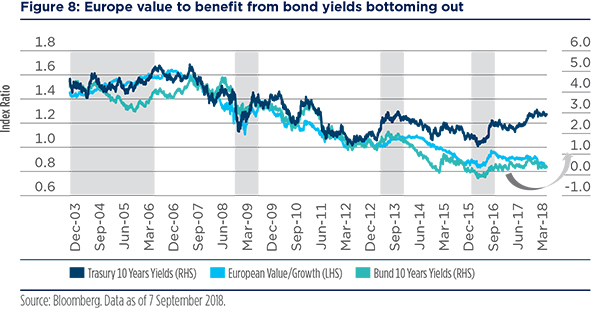 We think it is time for investors to combine value and quality in their European equity allocation, with a strong focus on bottom-up security selection. We consider it crucial to combine value with quality. This means investing in solid companies that have strong earnings power, healthy balance sheets and sustainable cash flow. In a world of increasing disruption across sectors, driven by innovation, regulation and trade disputes, it is also important to carefully assess the sustainability of each business model (avoiding companies with excessive financial leverage, which would be more fragile with interest rates trending higher, or companies with too aggressive management or exposed to disruption that could erode the earnings power). We believe that investors should play value and quality themes by paying significantly less for a business than it is worth, by buying average quality assets at a significant discount or high quality assets without paying a premium, or by seeking underappreciated growth opportunities. A combination of these key characteristics with intrinsic cheapness will be key to investing in the European equity market going forward. While the cycle is getting mature, it would be appropriate for investors to balance the cyclical and defensive exposure. On rotation, we note that after a long period of outperformance of cyclical factors, the return of volatility at the beginning of the year has started to have an impact on the cyclicals/defensives ratio. 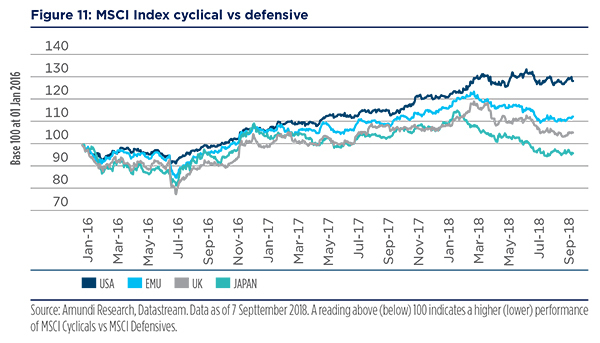 Although the first down leg of the market (from January to mid-February) was still favourable for cyclical stocks in relative terms, the second down leg (in March) enabled defensive stocks to outperform, and the move has been prolonged since then. The direction of interest rates in fact acted as a barometer; their rise accompanied, or even caused, the first downwards movement of equities. During the second down leg, they declined due to fears linked to the impact of protectionism on economic growth. In fact, it seems premature to be anticipating the end of the cycle at this stage. Corporate margins in Europe are still on the rise. And it should be possible for German long rates to increase towards 0.6% by mid-2019. The trigger for a clear turnaround in favour of a full rotation towards defensive stocks should certainly be sought in interest rates, when they hit a ceiling or even start declining again, on a global basis. That’s why, in our view, it may be a good idea to keep a balanced approach between cyclical and defensive. With a more balanced earnings profile, stock selection within the sectors could become more relevant to exploit the most compelling opportunities in terms of earnings growth. Moving ahead, we anticipate that earnings growth will continue to be the key performance driver, particularly as the earnings profile across sectors is set to change compared with the last year and a half, making bottom-up selection even more relevant to generating alpha in this new market phase. 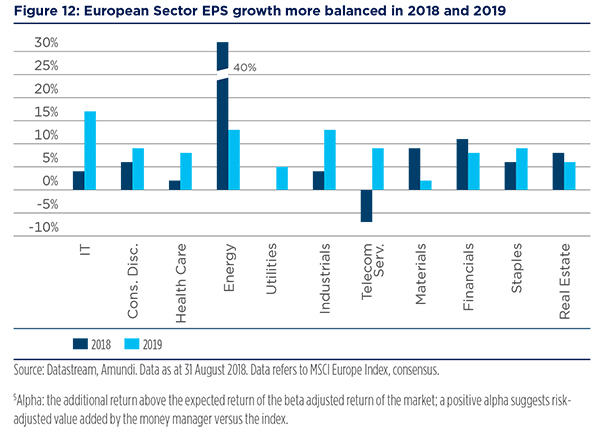 In fact, while in 2017, energy, materials and consumer discretionary (which represent 26% of the MSCI Europe index), made up 66% of earnings growth, for 2018 and 2019 we expect a normalisation of the contributions of different sectors. Banks and insurance should shine, energy should remain strong in 2018 but decelerate in 2019, and materials and consumer discretionary should start normalising. 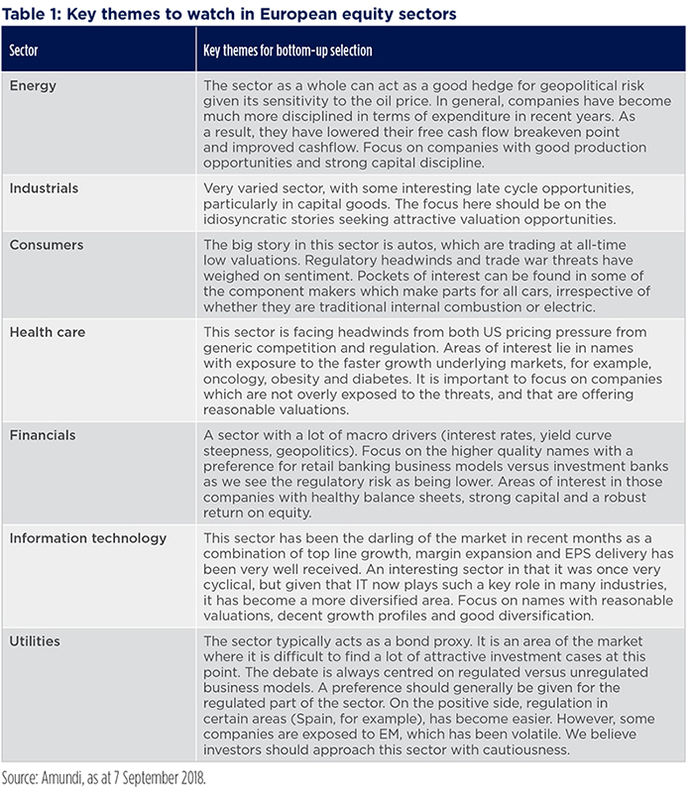 At sector levels, multiple themes are at play and will need to be carefully assessed in selecting the most valuable companies within each sector. At the overall market level, we still see significant dispersion among stocks in Europe. Investors should consider embracing an active bottom-up stock picking approach to identifying the companies that are better positioned to deliver sustainable earnings growth in this new market phase. High dispersion among stocks will give a fertile ground for stock picking in European equities. As we move into uncharted waters, where multiple investment scenarios could emerge, we believe that asset managers will need to further engage with investors in order to understand their specific needs. Doing this would allow managers to build portfolios that through a combinations of different investment solutions can be tailored around the specific risk profile and goal mix of each investor and that could be tactically reassessed should market conditions or investor priorities change over time. - Growth investment style aims at investing in the growth potential of a company. It is defined by five variables: 1. long-term forward EPS growth rate; 2. short-term forward EPS growth rate; 3. current internal growth rate; 4. long-term historical EPS growth trend; and 5. long-term historical sales per share growth trend. Sectors with a dominance of growth style: materials, industrials, consumer discretionary, staples, healthcare, IT. After a relative calm following the at least temporary resolution of the Greek crisis in the summer of 2015, Europe will have to once again contend with quite a build-up of political uncertainties. Equity markets: Watch out for the swinging doors! The signal launched by the deterioration in US companies’ margins can for the moment be put into perspective. 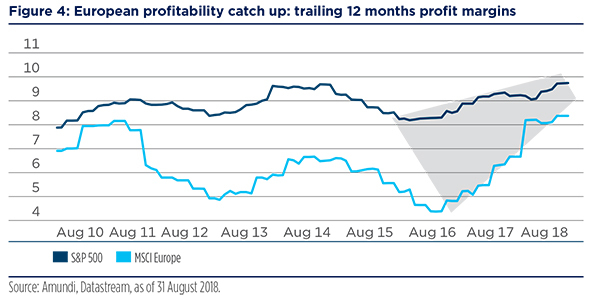 As long as US 10- year yields remain contained between 2% and 3% and corporate profits improve, which should be the case at least until the autumn given the favourable base effects, the equities cycle can continue.